Discussion in 'The Chronicles' started by Raigryn Vayd, Nov 22, 2018. Norther peak of Aberresai Savannah, one month later. They had travelled along the coast to keep from the dangers of the savanna. Some of the orc tribes there did not take kindly to humans crossing their territory. They had kept the endless ocean on their left and followed a well worn trail. They had seen a magnificent beast in the sky two days ago. Feathers of scarlet and gold catching the morning light. It hadn't taken an interest in them. That was a good thing. Only after it was beyond the horizon had Raigryn explained it could have lifted an entire horse from the ground in its claws. Fife was getting used to riding now. His pony was quite well behaved and followed his stolen horse quite contently. He had pulled less pained faces after a day in the saddle recently. The boy looked a little less gaunt. There was more colour in his cheeks, his hair looked more healthy. In a few years he'd probably grow into his boyish, almost feminine features. Kid was probably dealing with puberty now. Likely why he insisted on bathing well away from Raigryn when they found a clear stream. "I should probably tell you what it's like to teleport," he said. He could see the ground rising up towards a cliff that jutted out into the sea. He recognised the landmark. At the top of that ridge was one of the remaining portal stones. Traveling for a month had taught Fife two things: the word wasn't as scary in the ways she had expected, and the world was terrifying in ways she hadn't. Orcs, monsters, harsh climates, and a lack of familiar resources were expected challenges. Fife had taken each of them in stride and adapted accordingly. Mostly, she let Raigryn tell her what to do and how to avoid those troubles. He was well versed with the world, obviously, and was a front of knowledge -- both useful and concerning. She knew these would be obstacles she would have to overcome when she left Elbion, leaving behind the small scope she had been familiar with. What she hadn't expected was the wonder. The changing landscapes struck her with such awe, their wild beauty vast and immeasurable. She had seen mountain, desert, and ocean. She had bathed in streams and waters that ran clear and cold, and she had slept beneath the vault of the night sky with hundreds upon hundreds of stars looking down on her. Fife had even seen the awesome beast just days prior, a spectacle she would never have imagined from the dank alleys in Elbion. Sure, the saddle sores hurt after days of constant travel, and peeing and bathing were both awkward and terrifying, but the overall experience had been.... pleasant. It surprised her how much she enjoyed it, and with each passing day she felt more comfortable in the saddle and away from the comforts of civilization. She didn't know where they were going, and had just stayed with Raigryn because he hadn't yet told her to go away. He continued to teach her bits about the Aspects and using them, and though she certainly wasn't yet adept at them, had a tiny pool of Tranquility stored. It was the emotion that she could most easily identify, and had been a good starting point for practicing. She had also spent a great deal of time establishing a basis of communication. She had familiar signs for basic concepts and Empathy terms, and had a whistle for Raigryn, his horse, her pony, and Jason. She had been calling the steeds Dusty and Socks accordingly, and spending time with them had quickly remedied her fear of them. She was gawking at the sea, thinking about nothing while enjoying the briny wind on her face, when Raigryn suddenly spoke about teleporting. Fife immediately looked alarmed, her frown and furrowed brow all she needed to ask him, What?? It still amused him to see Fife shocked at some new possibility. His amusement still didn't seem to be well received. That hadn't dissuaded him from either delivering the news in a way to shock his young apprentice or laughing afterwards. He was increasingly seeing the boy as a permanent apprentice. That could change when they passed Elbion again, he knew, but that bridge could be crossed at the time. Raigryn closed his eyes and enjoyed the cool sea air. Maybe he would find enough coin to retire to a house by the sea one day. "Belgrath is far, far to the east of here," he explained. "As long as there have been men and stories passed down there have been portal stones. A mage can barely teleport and yet these seem connected at a level where a touch of magic can send you from one place to the next. Like...a tunnel through a mountain. A shortcut. When I activate the portal everything will go dark for a moment. Like dunking your head underwater. When you come up you'll be in an entirely different place. The most grand dwarven city left. The stone is deep below the mountain, a lift will take us back up." He turned in the saddle to gauge his reaction to all of this. As always, Fife listened carefully to Raigryn as he spoke. He explained the portal stones in simple terms, which was something he did for most new concepts as they were presented. This new idea was intriguing but terrifying. Her experience with magic was new and exciting, but this sounded like something completely other. He had said before that he had traveled through portal stones, and he was still alive. So they must have been safe enough if he knew what he was doing. If they weren't, well... she wouldn't be around to know it didn't work, would she? Fife drew a deep, calming breath and reminded herself that he hadn't put her in harm's way (yet). She looked up the rise to the stone. As they rode closer, she had the weird feeling like gravity wasn't quite working around her -- a queer lifting feeling that made her uncomfortable. Socks didn't seem to notice, and took her up the cliff without hesitation. As they carried on up the path the tip of the portal stone became visible. A worn shard of white stone that jutted up from the landscape. As they approached a perfect, black circle would become visible on the grass around it. "Please don't touch it when we get closer," Raigryn warned. "It doesn't take much magic to activate and you could send us to the other side of the world. Also at least one of the runes leads to a portal at the bottom of an ocean. I'd rather not go there." He laughed as he saw Fife's expression. Bringing his horse to a stop a few feet from the stone. Dismounting he went to the saddle bags to get the pair of blinkers he'd brought for the horses. It was best they could not see during the transport. "On the other hand, I can show you how it works!" he offered "Look out to the North and you can just see the Steppes and there is a stone there. The others are east. Its very simple and then you could travel half way across the world in an instant. How about that eh"
He seemed to enjoy shocking her, she'd learned, and yet she was never quite prepared for the outlandish things he said. At the mention of one of the stones transporting into the ocean, she had a look that was a mixture of surprise and terror. It sounded awful! How were they supposed to make sure a magic rock didn't take them to the bottom of the ocean?! Arriving at the stone, she worked hard to keep her nerves down, telling herself that he was just teasing her and not to take it seriously. The concept of what they were doing was huge, however, which made it easier for her mind to slip from horror to blank confusion and awe. Fife dismounted her pony and held the reins of both beasts as Raigryn put the blinkers on them, and used the opportunity to give the stone a good long look. They were standing in a circle of blackened grass -- not very reassuring, but she could assume that this was where they had to be to travel through the stone. The stone itself looked like a normal rock, except for a circular image carved into the flat side of the broad stone. It looked like some sort of serpent curling back onto itself to bite it's own tail, surrounded by a ring of strange letters. Raigryn had started teaching her letters, and while she only recognized about half of them reliably now, she was sure that these were not any of them. She waited until he was done outfitting the horses before she began her questioning by first pointing at the stone. Fife used her free hand to imitate his writing, touched her hand to her temple, then waved the hand away and shook her head before finally pointing back toward the stone. I don't know those letters. Then she pointed at the stone and raised both hands in front of her, one of them a fist and the other holding up two fingers. She quickly closed the one hand and lifted two fingers on the other. It was a good sign for teleportation, right? Fife then indicated pain, grimacing as she pointed her index fingers in toward one another. Is it going to hurt? Raigryn laughed from the belly. "I like that," he declared, trying to mimick her sign for teleporting a person between two fists. "The bit in the middle doesn't last long. Imagine being dunked underwater, but it's completely dark. That's the best I can think of to describe. Just trust me. It will be over as quick as it's started." He didn't mention that it was possible that the dwarven city could have fallen to goblins since he was last there. If that was the case he hoped they hadn't filled in the pit where the stone had been found. "No one knows this writing," he explained. "The large rune is for this stone. That one is the stone in Belgrath. That one the stone over in the steppes. This one is far, far to the east. And I think it might be this one that's under the ocean somewhere. Most don't work. Some others do, but no one ever comes back. Could be underground or underwater too. Makes you wonder who made them." Raigryn grinned as a thought struck him." It's very easy you know. Would you like to take us there?" Just trust me. Fife blew out a nervous breath and tried to do that. She looked the stonen over as he pointed out various symbols -- runes he called them. They were each unique, but seemed like utter nonsense. Of course, Raigryn was once again a keeper of vast information, and identified several. Did he know everything? She wouldn't have been surprised if he did. Whe he asked if she would like to do it, to use the portal stones, Fife's brows nearly hit her hairline. She immediately jabbed a finger ti her chest. Me?? In a swift succession of gestures, she pointed to herself, touched her temple and waved it away while shaking her head, and pointed to the rock making the teleportation sign. I don't know how to teleport! She wasn't sure if he was serious, but he seemed serious. Sure, he said it was easy, but what if she did it wrong? In spite of her better senses, however, it sounded exciting. She glanced between him and the stone, laughing nervously. "Come here, come here," he laughed, waving him over. If he was honest with himself, sometimes his teaching had been slightly less pleasant than he had let on. Trying to hit Fife with a bendy switch was the most obvious example. "Give me your hand," he requested. He stepped behind Fife and put his hand over the back of his. The boy was near shaking with nerves. This was perhaps the strangest and oldest magic left in the world. He had been terrified the first time. Even this time it made him a little nervous. Like jumping off a rock. Very slowly he pressed Fife's hand to the correct symbol. He trusted Fife but didn't want to take any chances. Nothing happened. Just a smooth piece of rock. Cold to touch. Just a subtle hint of magical power below the surface. "Reach into your aspects. Pick any of them. Draw just a little and focus on your hand. Don't need to cast anything. Just direct the magic forwards." Doing her best to keep her mind steady, Fife took even breaths and let him guide her hand to the proper rune on the stone. She looked up at him nervously as he explained, and it took her several more breaths before she felt brave enough to reach into her mind for her Aspects. She had the most of Tranquility, so she drew on that. And it was just like he had said. Fife didn't know how to swim, and had avoided moving and deep water where she could. But as she drew on her Empathy, there was a moment where everything disappeared and she had the inexplicable feeling that she was submerged in deep dark waters. There was nothing and she wasn't even sure if she existed in that moment or if she had blinked out of this world so easily. Yet after a moment of that deafening and endless nothingness, she seemed to blink and there in front of her was the stone. But not the same stone. She blinked in the strange lighting and realized this stone was different, her hand placed now in the stone's center over a much larger version of the destination's symbol. A bit giddy, Fife smiled brightly up at Raigryn. She'd done it! Everything was different. The bright light of the sun was gone. Raigryn blinked and let his eyes adjust. The dwarves managed to light their cities well enough, but their eyesight worked better in the dark. "Horses? Ye'll be paying for the lift then?" called a friendly voice. "Aye," Raigryn replied, half mimicking the accent. He looked up. They were at the base of an almost perfectly square shaft, twenty metres across. Dwarven statues looked down upon them from the walls. "Great stone masons the dwarves," Raigryn explained. There were two of them stood beside a metal platform at one side of the area. Gears ran the height of one wall to carry the lift up, probably connected to a windlass turned by several beasts of burden.
" Ye'll need the toll then!" called one of the dwarves as he opened the gate. Dwarves were also masters of commerce. "Go and check on socks, might be flustered," Raigryn told Fife as he eased his hand away from the stone carefully. Her eyes finally strayed to the cavern in which they stood. She marvelled at the statues looking down at them, the size of the subterranean shaft, the great gears rising on a singular wall. It sent chills through her, and she stood there dumbfounded and nodded absently as her tutor spoke. She finally wandered over to Socks. He was indeed a bit flustered; what he lacked in size he made up for in attitude and, though he was a splendidly lazy rider, he arguably had more personaloty than she did. Fife was smiling as she gathered up the reins that were still in her hands and soothed both beasts with a soft whistle, a tune that began with their names and shifted into a gentle melody. Dusty's ears flicked forward, and she gave his long nose a single pet. Well suited to his rider, he was pretty calm in most circumstances, and was just a horse doing horse things. Socks, on the other hand, was looking around and snorting, his little nostrils blowing a puff of air at her hand as she reached out to soothe him. Sjeptical little fellow, she remarked to herself. They were two of a kind, then. She finally petted his face, the worked around to his neck, and he began to settle. Fife continued to pet him and looked to watch Raigryn as he approached the two dwarves standing near a weird metal floor thing. She had seen dwarves before, and now it made sense how they would have travelled so far with their wares. With his purse slightly lighter Raigryn returned to help lead the horses onto the platform. He kept them facing the wall with blinkers now giving them a view straight ahead. The metal gate closed behind them and they started to smoothly rise. "You'll never feel like you're in so much space indoors as in a dwarven city," he said. "Halls with ceilings so high you can't quite tell how far up they are. They've got stables inside so we can leave the horses and head out to see the sights tomorrow. No matter how big you might think a mountain can be, we're under the spine of the world now." Raigryn had started to thoroughly enjoy each little surprise for Fife. Perhaps that was why he had no intention of returning to Elbion soon. Each time he could see something old anew with a wonder he hadn't felt for decades. He had been twenty four when he had first seen Belgragh and the spine and those memories were still clear in his mind. When Raigryn took Dusty, she led Socks onto the platform. He went without protest, unaffected by the clang of his hooves in the metal base. Fife, however, looked around nervously and jumped as the gate was closed and the gears started to grind. She nodded, but stood closer to him as the lift began; even with a gate she felt too close to the edge of the platform. The massive gears turned and they began to rise above the stone floor. She was shaking from a strange mix of terror and curiosity. Fife wanted to peer over the edge but was fastened to the spot by the irrational fear of falling. It felt like it was taking forever. She wasn't sure they were ever going to get out of this shaft, but the gears kept rising and rising. Slowly the view of the inside of Belgrath was revealed. Once it had been much louder than this, a true centre of industry for the Eastern world. Now it had just half the population it could support. When the lift stopped and the doors opened ahead they could see straight on through great arches for hundreds of metres. On either side lights picked out windows of settlements that seemed to have been carved into the walls. "This is the heart of the city. One great cavern end to end. The outside world is that way, but we're going to head for the stables and get some food. Ever had a dwarven pie? Oh careful with the ale. It's good stuff, not the watery muck you get in Elbion. Just one pint might make you dizzy. " She didn't know what to expect, having never even seen a cave. 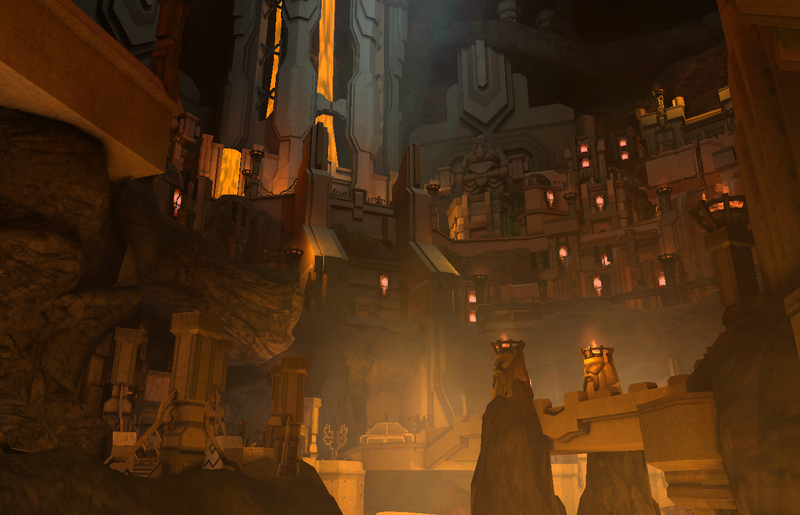 But in her mind she had crafted some kind of stone cavern and stone buildings akin to those in Elbion. She had imagined it to be dark and vague, lit poorly this far beneath the surface. Yet as they rose up into the city, her eyes went wide and her mouth fell open in awe. It was spectacular! Fife tried to drink it all in at once -- the great stone arches, the stone figures, the homes carved into each wall all along the length of the massive cavern. When she could think properly, she whistled a wow. Raigryn was explaining things and warned her against the ale. She made a small huffing sound as she laughed, then signed. Fife pointed to herself, shook her head as she cut her hand in front of her throat, made a motion like drinking, then waved her hand away from her. Then I won't be drinking any. Then, for comedy, she put a hand to her forehead and wobbled to the side while making a sickly face. She hadn't held her ale in very well in the month they had been traveling together, and ale generally made her go to bed very early. Fife wasnt afraid of laughing at herself, and she wheezed in near-silent laughter again. Raigryn laughed with him. There was a joy in his expression, eyes brighter than they had been when Fife had first met him. He was far more content on the road than he had been during the drudgery of pretending to be a simple scribe. He hadn't realised quite how much he had missed having someone to teach the art to. But it was seeing the wonder of the world through his eyes that brought him joy. "You can have a half of Brigman's lad," he encouraged. "Not a finer ale in the whole world." Looking down at how diminutive Fife was he decided to change his suggestions. "A quarter maybe." He led his horse towards a wide opening on one side of the city. More light streamed from there than any other. "Dwarves are very tidy with their cities. Each section has a specific purpose. So you want inns, food drink and markets, its this way." His assurance that she could have a half was quickly amended after a moment of scrutiny, becoming a quarter. She nodded and saluted, accepting that tonight she was destined for an early bedtime. She didn't know how long Raigryn intended to stay here, so she wasn't going to hesitate to accept whatever opportunities he afforded her here. Fife still wasn't a big fan of ale, thinking it all tasted pretty gross, but would put anything in her mouth if he had procured it for her; she wasn't going to be ungrateful. The underground city was a marvel. Raigryn steered them toward a brightly lit quarter, explaining how the city was split into districts by purpose -- a concept not too foreign after living in Elbion. Though it was apparent that the dwarves took it a step further. Fife looked about with hungry interest as Raigryn took them into a boisterous residential district. There was much to see, from the decorative stonework and the fine craftsmanship of iron gates and signs, to the plethora of bearded faces, each one somehow styled differently from the rest of the dwarven masses. Whistling Raigryn's name, she hustled Socks to catch up to him so she could sign. She was worried it might be rude to point, so she waved a general hand and cast her eyes toward some dwarves, then combed her fingers over an imaginary beard. She wasn't sure how to express "style", so she wiggled her fingers over her imaginary beard, like it was flashy or sparkly. Then she started to raise fingers -- one... two... three... -- in quick succesion. When she reached ten, she waved her hands away, indicating there were too many for her to count. In conclusion, she tipped her head and showed a palm up in question. The resulting was something vague, implying curiosity. There are so many beard styles. Fife was still learning how to convey her thoughts to Raigryn, but a month was a lot of time to lay down some groundwork. She was getting better at being patient when he didn't quite understand her, and she was constantly learning simpler ways to put into context what she wanted to say or know. This blanket observation and the expression of curiosity would do just fine. That look of mischief returned in full. He nodded to let her know that he understood the question. Glancing around and spotted a likely candidate for his plot. They were walking past a tavern he knew was good for food and had rooms with beds long enough for humans, but the stables were further down the path. In dwarven economy it felt as if every clan, group and person had a specific skill-set and job. "Excuse me," he said to a dwarf that was walking towards the tavern. "Aye?" the dwarf replied, coming to a halt. He crossed his arms over his chest and looked up at Raigryn. His arms were also covered in thick, dark hair. "My young friend Fife here hasn't visited the city before..."
"Oh welcome," the dwarf said with a mock salute. He narrowed his eyes as if he might have recognised Raigryn. "And he's been thinking of growing a beard and was curious as to why dwarves have such a variety of styles." "Hah! Well, such a baby smooth chin would certainly benefit from a beard, that much is true!" the dwarf replied. Raigryn ignored what he assumed were daggers being stared into the side of his head by Fife. "Now lad, from a dwarf's beard you can recognise their clan. Different generations also tend to go for different styles. Young ones tend to have shorter beards with several tails. Women normally have more decorative binds in their beards made of bronze or gold. Yes dwarven women have beards." He nodded as if he understood but didn't answer her. That ornery smile crept onto his face, and Fife watched him through narrow eyes as he scanned the crowd for someone. She didn't understand at first what he was about when he stopped a dwarf. When at last he caught on, she opened her mouth and looked to Raigryn in horror, as if she might say something to stop him, but it was too late. Crimson spread over her face and she glared mercilessly at her tutor before sheepishly looking at the dwarf, who fortunately took the man's humor well. Upon his first remark of her baby smooth chin, however, she began fighting a smirk. The joke was on Raigryn now. Until the dwarf mentioned dwarven womens' beards. She'd been fighting a secret smile, but she blinked in surprise and whipped her head to look at them both, as if this was some kind of joke between them. But the dwarf assured her that dwarven women had beards, so surely this wasn't in jest. She cast a final nervous glance at Raigryn. He surely didn't know yet. For all his worldliness and mischief, he could be a bit oblivious. She looked at the beard on showcase for a moment before looking between him and Raigryn. Fife pointed to the dwarf, combed her hands down either side of her face over an imaginary beard, then used both hands to trace the generic shape of a house. It was once again a vague question, inquiring about his beard and his clan. How does his beard show his clan? She looked nervously from Raigryn back to the dwarf, hoping she wouldn't overstep her curiosity. "Oh, Fife is mute," he explained to the dwarf. "Sorry, didn't introduce myself, I'm Raigryn and this is Fife." "Bellin, pleased to meet ye." "House..." he muttered. "Oh right. Fife would like to know how your beard distinguishes your clan, if you don't mind him asking." "Oh right, well, it's the two braids coming together here to form one," he said, trying to indicate the thick braids that formed one long one that reached to his midriff. "And the green gem on copper on either side here." He toughed small braids below his ears. "Course this took me a hundred and twenty years to grow so nicely." "All the options you'll have when you need to actually shave Fife," Raigryn laughed. She waited as he translated for her, then nodded nervously. The dwarf, Bellin, seemed happy to elaborate for her. He pointed out some very impressive braids at the front of his beard, then some smaller, though equally impressive ones at the sides of his face. She blinked, startled by the number of years he gave her. She quickly held up the numbers one, two, zero, as if he may have misspoken or she had misunderstood. One hundred and twenty? Her surprise quickly turned to a smile when Raigryn teased her. She rubbed her hairless face with both hands and grimaced. They'd be waiting a while on that -- a lot longer than they thought. With a wry smile, she began signing again by indicating him, pointing to her eyes and swinging the fingers toward him. Then she held her thumb and index finger out at an angle similar to a straight razor as she ran her thumb along her cheek. I don't see you shaving. Then, indicating him again, she signed for a beard before grimacing and wriggling her fingers about her jaw. But your beard is scraggly, she teased. Her eyes were glittering with mischief as she smirked up at him. "Eh?" went the dwarf. He assumed it was some formal sign language when in fact Fife had to make it up as she went along. "He was a little surprised by your age. And then being rude about my own beard I think," Raigryn replied. He had came up to absentmindedly scratch at his beard. He wasn't quite sure if Fife was suggesting it was too long or too messy. He picked up enough intent to know it didn't matter. "A hundred and twenty is still quite young for a dwarf," Bellin laughed. "Generally considered a venerable and wise dwarf beyond two hundred. Old Gadumi managed four hundred and fifty they say. And yer beard is pointlessly small," he added with a wink towards Fife. His estimation was close enough, and he did the thoughtful-chin-scratching thing, so me must have been trying to figure out what exactly she meant. His beard didn't look awful, per se, but he certainly didn't groom like the dwarves did (or even most humans, for that matter). Bellin explained that he was still considered young, and gave numbers for a "wisened" dwarf and for a dwarf whose longevity was reputed. Fife blinked. She'd had a vague understanding that some races lived longer than humans but, with little exposure to them, hadn't realized just how long. She flashed her fingers, tens and tens, then waved then apart. So many! She would be glad if she made it another ten, fathoming another hundred years of life was beyond her. She smiled and sheepishly looked up at Raigryn when the dwarf joined her teasing. He wasn't used to her jesting him back. Humor in general was still fairly new territory for her. Fife touched her hand to her mouth and waved it toward the dwarf, bowing her head forward along with the gesture she'd adopted for Thank you. It surmised somewhere between a flourish and saying "I give thanks to you". Close enough. Bellin had been patient enough to answer enough of her questions, she thought. She didn't want to keep him from the tavern he'd been on his way to. Sometimes Raigryn needed to stop and imagine what it was like to live out your life in a small community. Elbion wasn't small, but Fife had probably seen a limited side of it. There would folk who lived out their entire lives in a village of fifty people and never felt any discontent for it. If everyone had been like that, would there have even been magic? They bid farewell to the dwarf and had the horses stabled. The portal stones were known to quite a few. A token to pass through could be bought from a mage for a small fee. Most in the stable however were short hardy mountain ponies. The kind that could climb the narrow mountain trails easily. "Fife?" he asked suddenly as they walked back towards an inn. "Are you happy travelling?" It seemed an innocuous question but his expression suggested the answer was important.